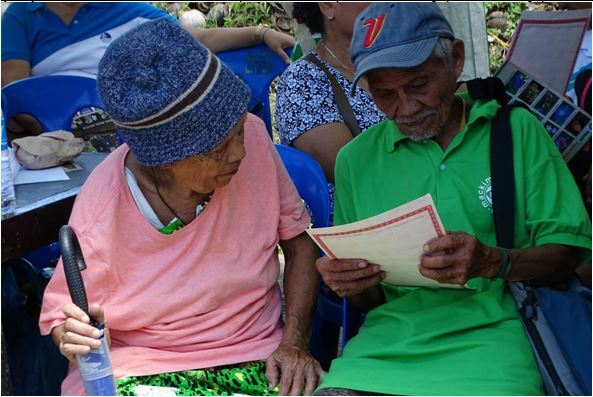 CARMEN, Bohol, October 7 (PIA)—Seventy-three year-old Fulgencia Achivida has only faint hopes that the small patch of land she inherited from her parents in Barangay Lataban, Sierra Bullones town can be issued an agricultural patent. After all, she has almost forgotten that she and her 77 year-old husband Nerio have applied for free patent to a patch of land that she hopes would be finally be under the couple’s name and with a document to prove their ownership. The 1,300 square meter lot is planted to rice and some banana patches , one that also allows them a modest stockpile of palay after every harvest. Located in the next barangay, the lot, being not yet under their name, is often left last to be planted, as the couple can’t confidently plant and claim the harvest of they own no documents to prove they own the patch. Both Fulgencia and Nerio could not believe their luck that both had to go to a corner and simultaneously pore at the land title that finally puts the patch of land under their conjugal ownership. Both were among the 11 lucky farmers of Sierra Bullones and Dagohoy who were finally handed their certificates of titles for either residential or agricultural lots under the Government’s Free Patent program, explained Provincial Environment and Natural Resources Officer (PENRO) Eusalem Quiwag. That day, the Office of the Cabinet Secretary of President Rodrigo Duterte led by CabSec Leoncio Evasco and the Office of Participatory Governance of the Office of the President brought to Carmen, Bohol its innovative Biyaya ng Pagbabago (BnP). BnP is the government’s response to the need for the bureaucracy to come out from the offices and bring the services to the grassroots, CabSec Leoncio Evasco said. Conducted in a typical one-stop-shop setting, the BnP brings over 30 government agencies and offices to one location, to dispense of their services, deliver frontline services and usher in the blessing of change. That day, the Department of Environment and Natural Resources (DENR) handed out the 11 land patents for both residential and agricultural lots. The DENR acted in line with Republic Act No. 10023, or the Free Patent Act which aims to ease the requirements and procedures in the titling of residential and agricultural lands by allowing people who have been residents of the lot and have been paying for its taxes to get a facilitated free patent provided these lots are not within forested sites. The Achivida lot is Fulgencia’s share, being among the heirs of her parents when they died. Both Fulgencia and Nerio could not believe their luck as they took turns in reading the certificate of land title, not really minding the midday sun. Also getting similar Certificates of Land Titles for either residential or agricultural were Rufo Cagampang of Magsaysay, Sergio Dagupan of Danicop, Demetrio Caderao of Danicop, Illuminada Auxtero of Magsaysay, Sabina Doyongan of Anibongan, Cherlita Cutamora of Bugsoc. Bernardino Duyogan of Anibogan, Nelson Cagulao of Anibongan, Aurelio Duyogan of Anibongan, Esmeraldo Dumayac of Poblacion Dagohoy, and Carmen Autentico of Anibongan. These people who have been finally issued free patents can now rest in the security that they can not be easily evicted from their lots, own the proper documents to put up these lots as loan collaterals, or sell them in the future. The Residential Free Patent Act also aims to provide economic stimulus to the land market and thus contribute to the country’s overall economy, DENR Bohol sources added. The registration of these turned over land titles, identify each individual lots and the state in turn confirms that the person named in the register has stated rights. it creates basis for land taxation and stimulate investment. For an individual, it offers a reduced or no boundary disputes, increased market value, greater opportunities and access to credit, it creates an avenue for a simpler and less costly land transactions too. Beyond that, other benefits include proof of ownership to avoid confusion and commotion, it helps promote peace as it clearly protects the property rights. Then, prospective buyers can be assured that the registered owner is the legal owner. Titling also allows the government to possibly earn more from land taxes, which in turn can be used to fund government initiatives and priorities. With a title for the 1,300 square meters of rice land in Lataban, Nerio would not feel seeding the 7 gantas would now be a waste. And with rice crisis in Bohol, he thinks he can help in his own little way by supplying some of the harvest for food in the community.